One of the first signs of spring in the garden is the sprouting of spring bulbs. Planted in the fall, bulbs bring joyous colour to our spring. While fall may be the time to plant these beauties, spring is the time to plan for them. The earliest to bloom are the snow crocus; often in bloom the day the snow melts off them (or maybe under the snow?). Like many of the small bulbs, crocus can be planted right in the grass, as they will be finished flowering before the first mowing. Other bulbs that will plant well in the grass includes; Scilla (those silly blue flowers in the grass), Puschkinia, Snowdrops and Chionodoxa. Keep track of the spot where the snow melted first; plant some of these bulbs there for a spring lift. Bulbs planted on top of the septic tank sometimes bloom in late February! Photographs are a great way to track bulb placement. Come fall it can be hard to remember where the holes were in the bulb display. A couple of photographs (be sure and include landmarks identifiable in fall) are a great reminding tool. 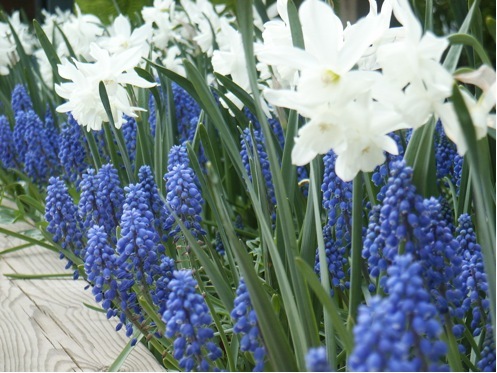 Bulbs are generally drought tolerant, and in fact too much watering will cause them to rot. Other reasons for failure include cutting the foliage off too early. The nutrients in the leaves are used by the bulb to produce next years flower. The practice of cutting off the foliage will weaken the plant. Instead, use elastics to bend over the foliage so it shows less. Combining bulbs with perennials can work very well. Daylily foliage can camouflage daffodil foliage very well. Crocus foliage in a border can be braided for a tidy look. Daffodils, Grape Hyacinths, Eranthis, Fritillaria meleagris, Snowdrops, Leucojum and the small bulbs mentioned above all naturalize well in a woodland area, giving many years of joy for a small investment in the fall.